Chrysoprase, chrysophrase or chrysoprasus is a gemstone variety of chalcedony (a cryptocrystalline form of silica) that contains trace amounts of nickel which gives the Chrysoprase its green color. 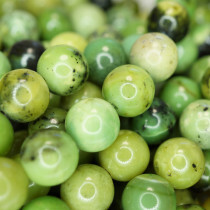 Chrysoprase is composed of crystals so fine that they cannot be seen as distinct particles under normal magnification. This sets it apart from rock crystals. Ancient Greek, Romans and Egyptians used chrysoprase in jewellery and other ornamental objects, and due to its semi-opaque green colour it is often mistaken for imperial jadeite. 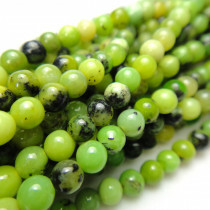 Chrysoprase Round 4mm Gemstone Beads (100pce Strand) - 40cm/16'" Strand. 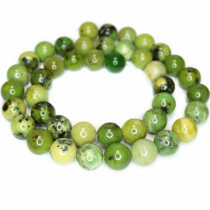 Chrysoprase Round 6mm Gemstone Beads (66pce Strand) - 40cm/16'" Strand. 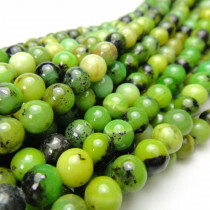 Chrysoprase Round 8mm Gemstone Beads (~50pce Strand) - 40cm/16'" Strand. 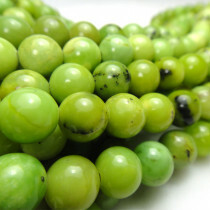 Chrysoprase Round 10mm Gemstone Beads (40pce Strand) - 40cm/16'" Strand. 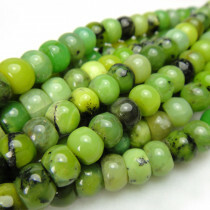 Chrysoprase Rondelles 4x6mm Beads (100pce Strand) - 40cm/16'" Strand.